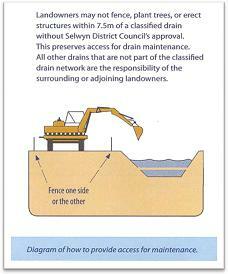 The primary function of a land drainage network is to drain land. In some areas the drains also receive and convey stormwater from the townships. Many areas of the District are extremely flat and flooding and surface ponding can occur during and after heavy rainfall. The classified land drainage schemes help drain the land following these events. Approval from Council is required prior to any structure being placed in a classified drain and Council's swales. In addition to making an application to Council, it is the applicant's responsibility to consult with Environment Canterbury prior to excavation works being undertaken in or adjacent to any drain to determine whether resource consent is required. Refer to our Standard Drawings for culverts [PDF, 211 KB] over Council drains and swales for guidance. Right picture: an example of damage to entrance way in a private property as culverts has not been installed correctly. There are a large number of private drains which are the responsibility of the surrounding or adjacent property owners. We manage and maintain nine classified Land Drainage schemes with the support of local land drainage committees: Osbornes Drain Land Drainage scheme,Greenpark Land Drainage scheme, L2 Land Drainage scheme, Ellesmere Land Drainage scheme, Leeston Land Drainage scheme, Taumutu Land Drainage scheme and Culverts, Wairiri Valley Land Drainage scheme, Hororata River Drainage, Bealey River flood protection. Refer to our detailed Maps [PDF, 5422 KB] showing all classified drains. If you are concerned about your drain or needs to be inspected please Contact the Council or your drainage committee rep. Environment Canterbury operate and manage the classified drains in the Halswell catchment, see in green in map below. Check Canterbury maps website for more detailed information. We periodically clean or spray the classified drains, however not all drains are cleaned every year. The Land Drainage Advisory Committees help with prioritising drain cleaning requests, considering budget and need. Our contractors work to guidelines of drain management best practice. Spoil from drain cleaning activities is routinely deposited on the banks of the drains in windrows. We remove tailings from the banks of drains when; it is considered a safety hazard, is within 0.5m of the road formation or when the operation of the drain is compromised. We can, under the Local Government Act and Land Drainage Act 1908, enter private property to investigate and undertake maintenance on classified drains, and require that property owners remove obstructions from any drain if it is causing flooding to other properties. Refer the Council Bylaw 2018. Contact the Council if you have a request for drain cleaning or spoil removal. You must ensure our contractors have access to classified drains for cleaning. No structure, fence, plant trees allowed within 7.5 m of a classified drain. If a drain cannot be cleaned this may caused issues to the whole scheme and prevent water being drained from adjacent properties. Each property owner owns their entranceway culvert over all types of drain and are responsible for its maintenance and replacement. You are responsible for maintaining vegetation adjacent to classified drains. All tree trimmings should be removed from drains immediately to prevent blockages. Make sure trees, hedges and other vegetation do not significantly overhang the drain. Planting of the land drainage network can be attractive and help increase native biodiversity and improve water quality. Refer to further details and approved list of planting. To protect the quality of our waterways and Lake Ellesmere, we strongly encourage you to fence heavy stock (cattle, deer and horses) from all drains and waterways. 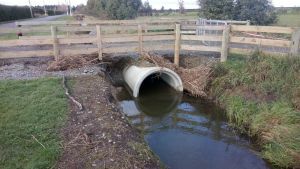 Environment Canterbury regulates the fencing of stock from rivers, lakes and wetlands. For further advice on fencing requirements contact Environment Canterbury. Further details of these schemes are provided in the Activity Management Plan. Settlers from the 1850s onwards found the district mainly flax swamp with light tussock on the higher lands. In order to bring the swamps into production a system of drains was installed, some by the Ellesmere Road Board, but mostly by the settlers. The country became highly productive and up to about 1920 the drainage was reasonably adequate. With settlement the system became inadequate and flooding became frequent. 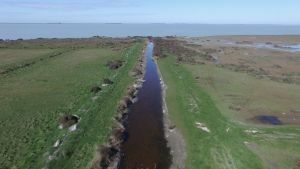 In the early 1940s the North Canterbury Catchment Board took over control of Lake Ellesmere and determined a policy of opening the Lake in summer and winter. The then Works Department also constructed two ocean discharge culverts that were lower than existing culverts. This allowed the benefits of significant improvements to drains (which took place from late 1942) that discharged into the lake and sea to occur.